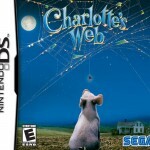 SEGA® of America, Inc. and SEGA® Europe Ltd. announced that actor Dominic Scott Kay, who voices the role of Wilbur in Paramount Pictures’/Walden Media’s presentation of a Kerner Entertainment/Nickelodeon Movies production, the holiday release Charlotte’s Web, has reprised his role in the DS™ and PC versions of the Charlotte’s Web video game. The game is was released on November 14, 2006 and is also available for the Nintendo Game Boy® Advance and mobile phones. Players of all ages will explore the charming world of Charlotte’s Web as Wilbur and Templeton the rat in four interactive environments, including Zuckerman’s Barn, a Junkyard, the Countryside, and the County Fair. Each area offers numerous challenging levels, a colorful cast of characters, and a variety of mini-games. Through his familiarity with Wilbur in the upcoming movie, Kay is able to bring his big-screen movie magic to the character in the DS and PC versions of the game.